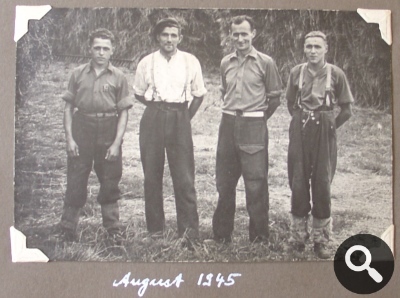 Eberhard Wendler’s diary records some of the events which broke up the monotony in the POW camp where he was held prisoner during the last weeks of WW2. 8 March 1945: visited the camp dentist in the morning and walked in the afternoon. 15 March 1945: at the dentist’s again (he extracted one of my teeth, left upper). I bought myself the book, ‘English in a few days’ – both volumes – for four shillings. 16 March 1945: had my watch cleaned for one shilling and had my two pictures framed. [Note: many of the POWs had skills which they could barter in this way]. 18 March 1945: we received our second uniform. I got just one coat, and exchanged a pair of socks. Since 11 March I’ve been attending English classes, Saturdays and Mondays. 26 March 1945: a rainy day – we were all back in camp by 4.00 p.m. I received two packets from home. 29 March 1945: I bought myself a large mirror for “1.8 Schilling” [1s 8d – about 8p in decimal money] and two brushes for one shilling [5p]. 30 March 1945: (Good Friday). We worked till evening. On 31 March and 2 April there was no work – Easter. 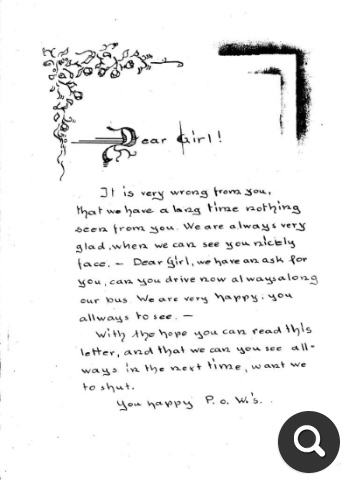 Note from Robin: the above are actual diary entries from 70 years ago, recording the events in one soldier’s life. In Hitler’s Last Army you can read about the Big Picture, with events and decisions which affected tens of thousands of German prisoners in the UK! While researching Hitler’s Last Army I stumbled on an extraordinary story. On 12 September 1947, a group of about 25 civilians – mainly women and children – climbed into the back of a truck which was to take them to their camp after a day spent picking hops near the Sussex village of Bodiam. The bridge at Bodiam, where some 25 hop-pickers were saved from drowning by German prisoners of war. 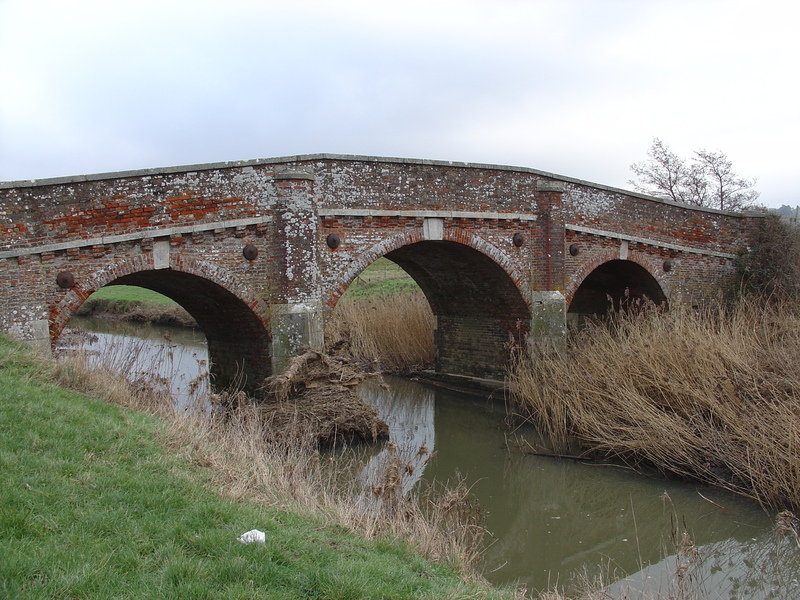 The parapets at either side of the bridge were not in place in 1947. The vehicle was crossing the narrow bridge in the village when it crashed through temporary railings and plunged into the river, turning on to its side. Most of the passengers were stunned: some were injured. The canvas cover over the back of the truck prevented most of them from getting out, and they were at risk of drowning. I still think it’s a great story! It’s certainly thought-provoking. I decided to include it as an illustration of what many people would consider to be unexpected qualities in German servicemen just after the Second World War, and used it as the Prologue to Hitler’s Last Army. 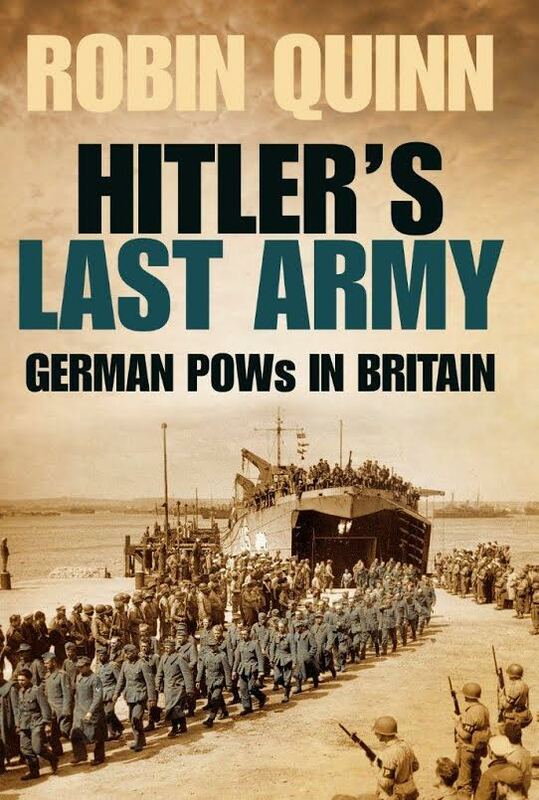 (Some readers may be suprised to know that German POWs were still being kept in Britain as late as September 1947. In fact, there were about 200,000 at that time, many of whom were not repatriated until the following year). I’m grateful to Keith Ennis, whose website, Bygone Bodiam, has been extremely helpful in my research. I recommend it as an extremely interesting read! Here’s a sample of the text – and on the History Press blog there are several photos from the book. In 1945, when the war in Europe came to a close, 150,000 German prisoners were already being held behind barbed wire in POW camps in Britain. 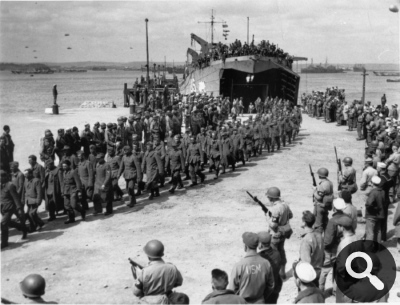 Most had arrived within the previous twelve months, following Allied gains after the D-Day invasion. Britain had several reasons for wishing to keep the prisoners. Most importantly, they provided an indispensable workforce – especially in agriculture. The nation had been forced to double its agricultural output during the war, and the German prisoners accounted for 25 to 50 per cent of all agricultural labour across the country. Others were employed clearing bomb-sites and helping to rebuild the nation’s shattered infrastructure. British politicians believed that while the Germans were still in the UK they might as well be taught to reject the Nazi doctrine they had grown up with and converted into peace-loving democrats. “Re-education” – as it was called – met with some success, though it was later acknowledged to have been a hopelessly over-ambitious plan, with results that were seen as “patchy and qualified”. A distinct shift in public attitudes towards the prisoners became apparent as time passed. Residents of Chatham, Kent, protested at first when they learned that a POW camp was to be built near their homes. But when prisoners were allowed in late 1946 to mix with the public, many of the same local families invited the Germans to their homes for Christmas. [* The final count was just over 400,000 POWs, which includes 120,000 others, not mentioned above, who arrived between the end of the war and 1946, when prisoners from the USA were shipped to Britain]. [Evidently the postal service was still slow. Many useful items were bought, sold, and bartered among the prisoners. Two shillings (10 pence in decimal currency) represented a prisoner-of-war’s wages for two days of farm work. Cigarettes were also used as currency: four cigarettes were worth about one shilling]. Clearly little of note happened during the next three weeks or so, because Eberhard makes no entries of any consequence until mid-March. 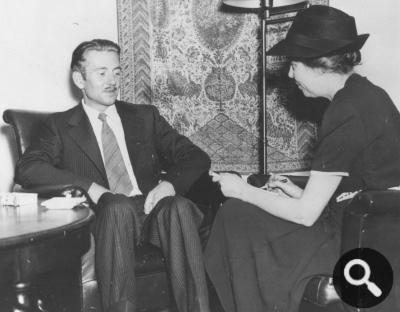 We’ll join him again then – seventy years on! ‘10 February, 1945: at 2.00 p.m. I received the first parcel from home. It contained skin cream, a mirror, a mouth-organ, a handkerchief, socks, sugar cubes, sardines in oil, and cakes.